Crazy Fallas Friday! | Nos vemos amigos. Here’s how our day started, bright and early. We would have liked a bit more sleep, because we went out last night to hear Devin play at Vitti again, but sleep is barely tolerated during Fallas. 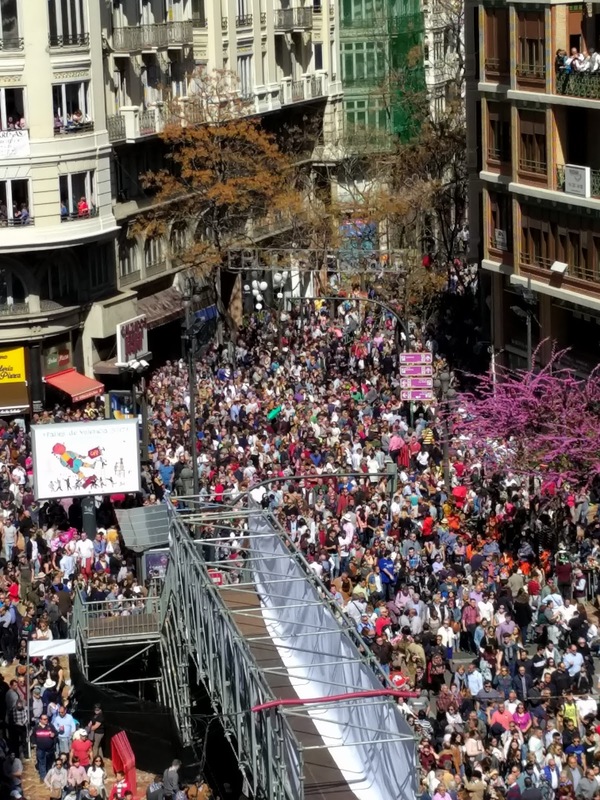 There are non-stop mascletas anytime, night or day. 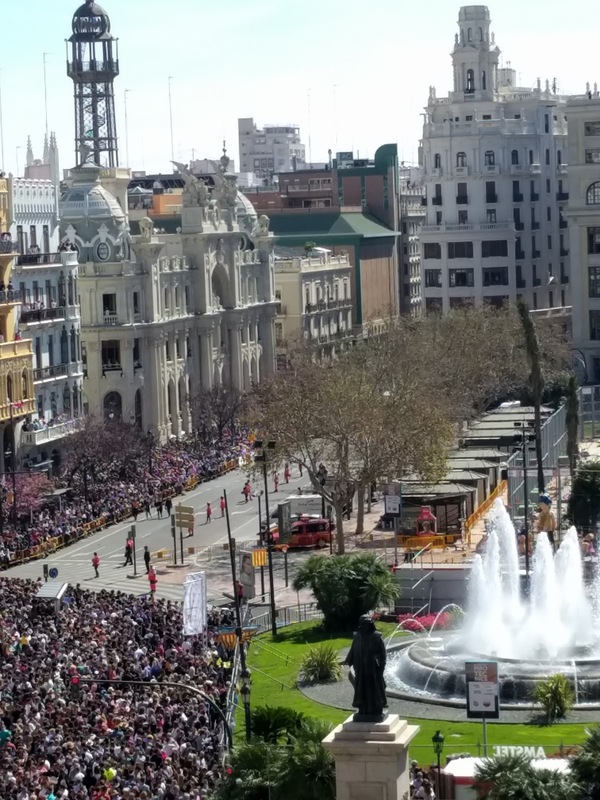 Around 12:30 we left the apartment headed for a mascleta-viewing party with a group of expats living here in Valencia. 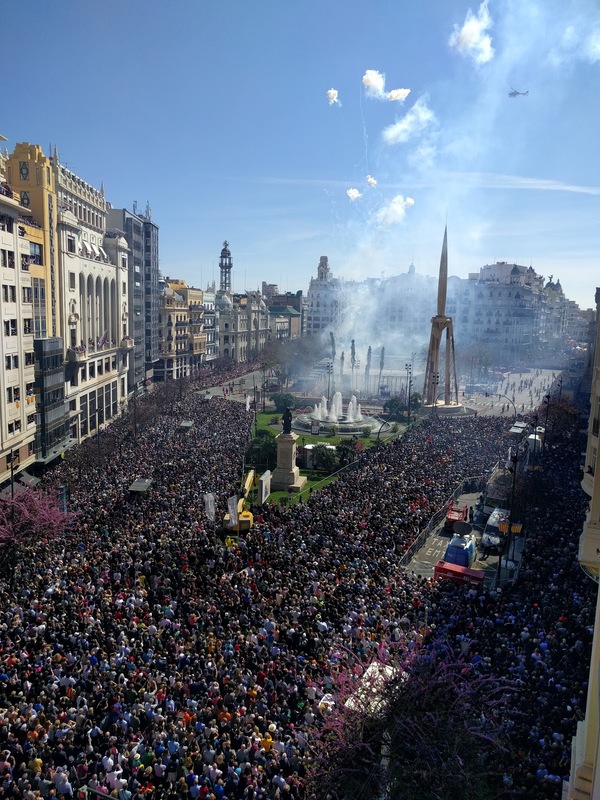 The party was hosted by Don and Elaine, Canadian transplants, who have an apartment on the fifth floor of a building overlooking the Ayuntamiento, ground zero for Fallas. 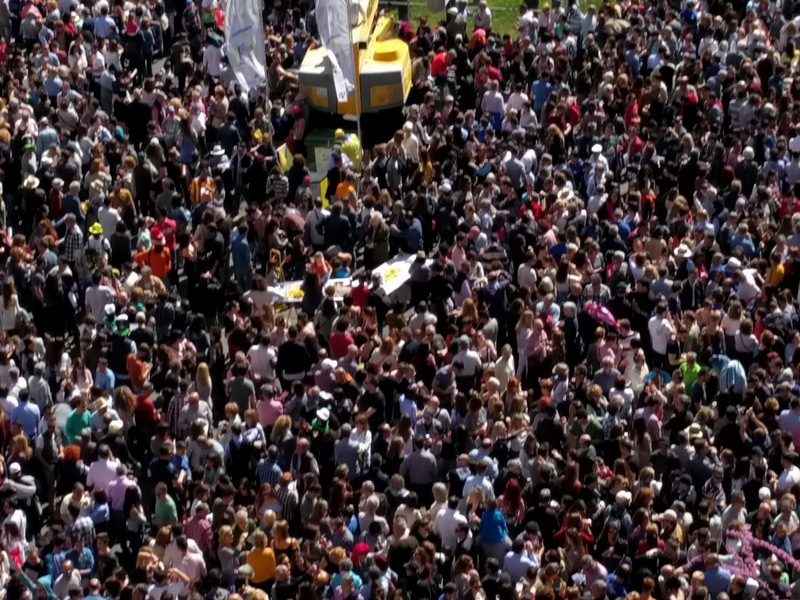 We managed to wade through the throngs of people, reach the apartment, and get some pictures from above. It’s hard to show in pictures the size of this crowd. Maybe this video will help. 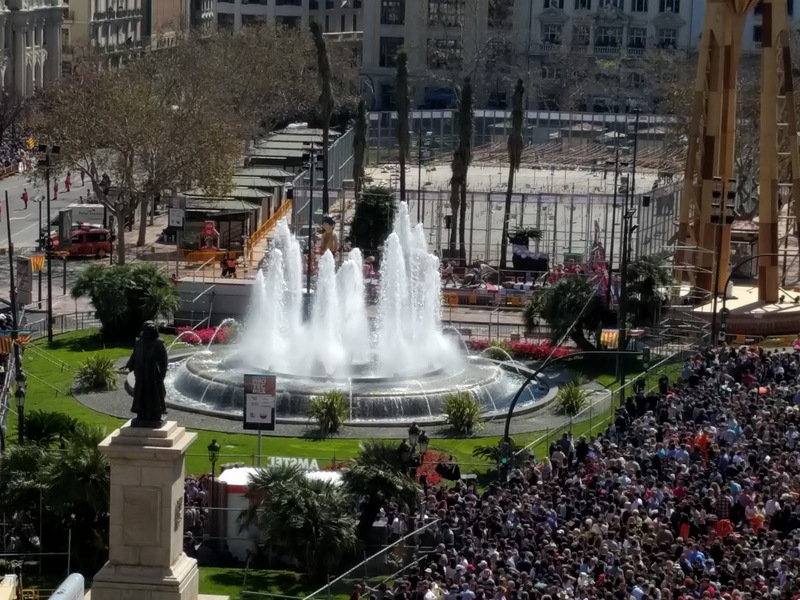 Here’s how the plaza looked when the mascletas started. And here’s the plaza after about 10 minutes. 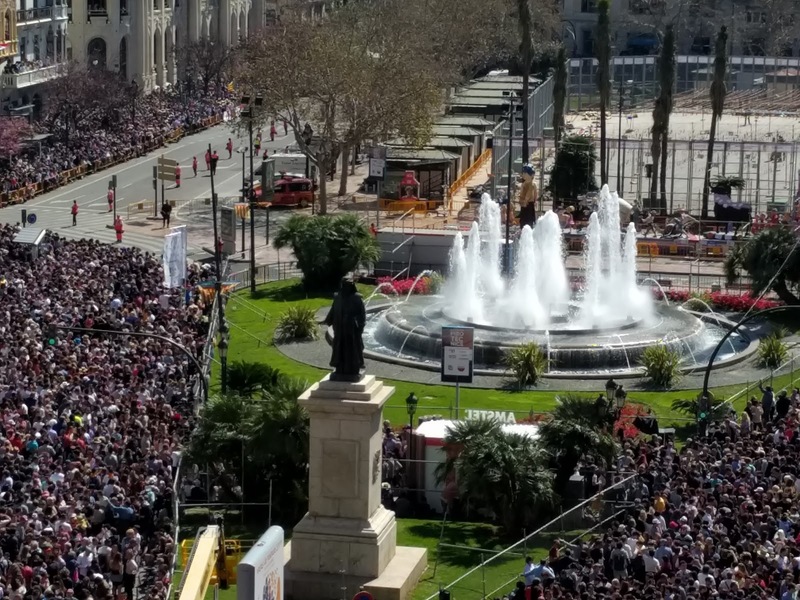 We waited for the crowd to settle down a bit after the mascletas, then made our way to the Plaza de Virgen for the flower ceremonies with the falleras. Falleras are the women and girls who dress in ornate, native Valencian costumes for many of the Fallas events. 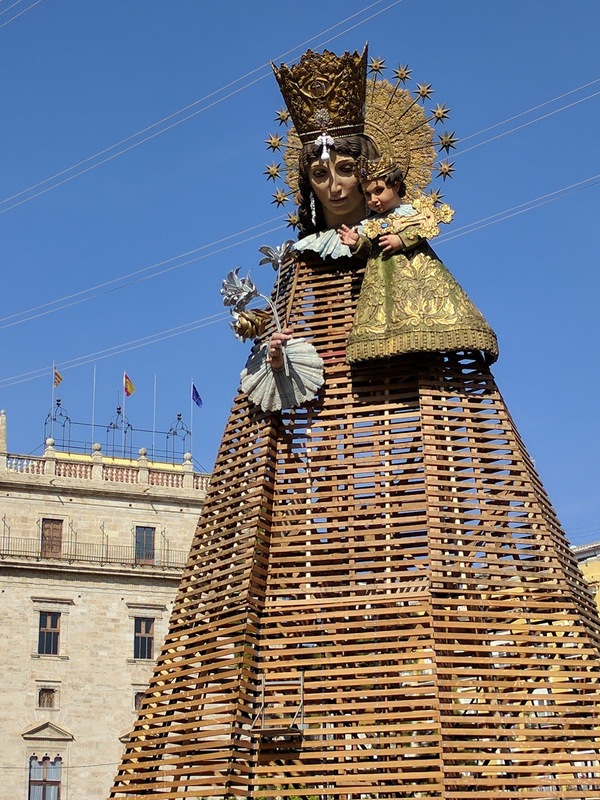 For this ceremony, each neighborhood sends a representative group of falleras who bring bouquets of flowers to decorate a huge statue of the Virgin Mary. Each group includes the falleras, some falleros (men in native costumes), and usually a band of some type, and makes up a small parade. As the parade passes, the flowers they have brought are added to the lattice of the statue. Here’s how it looks before the ceremony. And here’s how the flowers are added. There are so many neighborhoods represented that the ceremony is held on two consecutive days. We were here at the start of the first day, so we saw the first few bouquets presented. 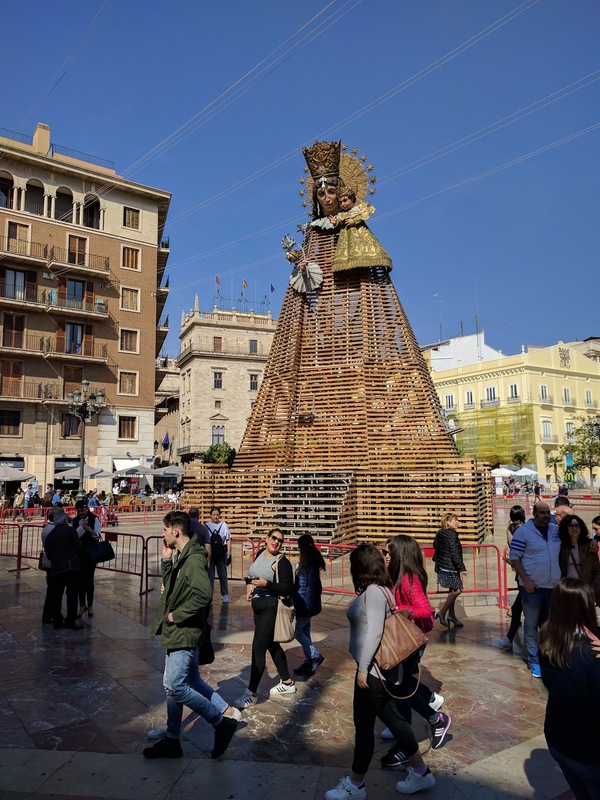 We spent the rest of the day wandering in the very crowded city, enjoying the many fallas which are now completely built and proudly displayed. 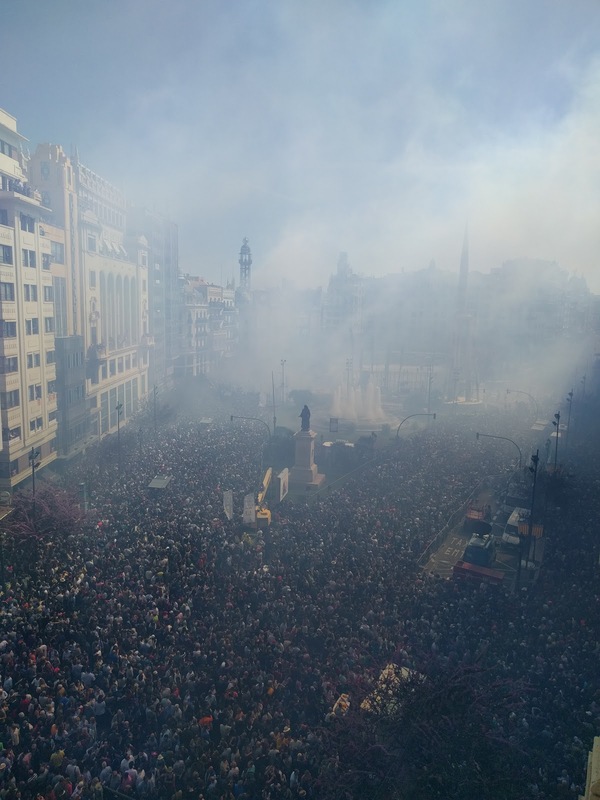 The entire city is partying now, and it’s quite chaotic, since each neighborhood seems to plan its own little events. We were pretty tired when we got home in the early evening, and decided to stay in and catch a soccer game on tv. Sure enough, about 9:00, there was a parade through our neighborhood to close out a long day.